A warning: this is a new area of my stash, all accrued in the last week or so, and so it mostly consists of samples. Without further ado, Lush hair care! I spent an incredibly fun couple of hours in Lush last week, chatting to the very lovely assistants. They drew my attention to the hair care range that Lush does, which I’d never considered before, being a) quite loyal to Aussie for shampoo and b) a bit scared of the high prices! 1. Blousey shampoo (the tub on the right). This looks really strange, because it’s made from bananas, so it’s a glossy, silvery brown. It smells incredible – it has the same scent as Flower’s Barrow, the perfume I fell in love with last week, and I just can’t stop sniffing it. I actually cheekily got two samples of this, and the first little pot did me two washes – I usually use loads of shampoo, so I was very impressed. This doesn’t lather very well, which is an odd feeling, but it left my hair impressively clean and soft and shiny! I would like to buy this, but at £18 a 240g pot, I don’t know if I can justify it, however little I use. Perhaps a birthday list item. 2. Retread conditioner (second from right). This is a smooth, white conditioner that smells like Parma Violets. I haven’t used it yet, but it smells delicious and is apparently great for damaged hair. This is slightly cheaper than Blousey, £9.95 for 245g, but I use even more conditioner than shampoo, so I need to test how much of this I have to use. 3. Jasmine and Henna Fluff-Eaze (second from left). This is a conditioning mask – you put it on your hair 20 minutes before you wash your hair. I have enough here to do the ends of my hair, but I’m putting off using it because I’m not a big fan of the smell… I’m not sure why, because I love jasmine, but this just smells too sharp for me… Working up the courage! 4. R&B styling cream (on the left). This is a much nicer jasmine smell. It has the texture of butter, and works into the hair really nicely to kill fluff and frizz, without being heavy or sticky or crispy. I’ve used about a quarter of the amount I was given, using it on the end of my hair every day just to tame the ends, and I love it. This is £10.95 for 100g, but I reckon that would last forever, so I’m seriously considering repurchasing this! This last product is not a sample, but I will admit it was a freebie. I visited some friends last night who work in Lush (hello!) 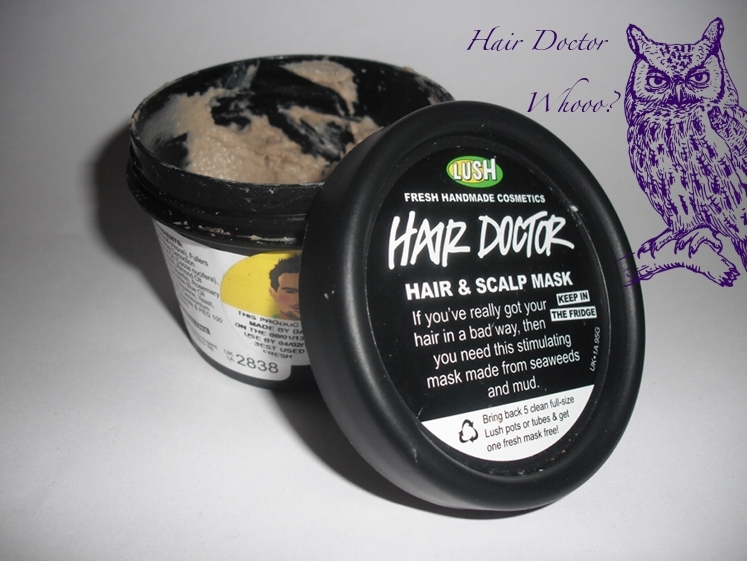 and they were incredibly sweet and gave me a pot of Hair Doctor mask, saying they had trouble using up all their freebies (it is a bit out of date, but I didn’t think it was any less effective). It’s so lovely! It smells herbal-ish, like Olbas Oil, and I couldn’t stop sniffing it on the way home – cue weird looks on the bus. I used this tonight, and I love it. You apply this mask to dry hair half an hour before washing it. In order to cover my hair well, I used about 2/3 of the pot, and I’ve saved just about enough to do my scalp and the ends of my hair another time. It feels very cooling and tingly (partly from the peppermint, partly because it’s a fresh mask that has to be kept in the fridge). Then you wash it out with shampoo and conditioner (I used Blousey and then the end of a Herbal Essences conditioner) and let your hair dry – voila! I didn’t even feel like my hair needed washing once I’d rinsed the Hair Doctor out, it was so soft and nice (even though it was wet…). My hair takes ages to dry, but already it looks a bit less tired than it did, and it is so soft. If I only get one and a half uses out of it, this is a little bit expensive to buy regularly, at £6.95 for a 95g pot, but if used as a scalp treatment, I could probably get 3 uses out of it, and I would certainly consider buying it as a restorative treat every three months or so, perhaps as an end of term pick-me-up so I look a bit less shattered. 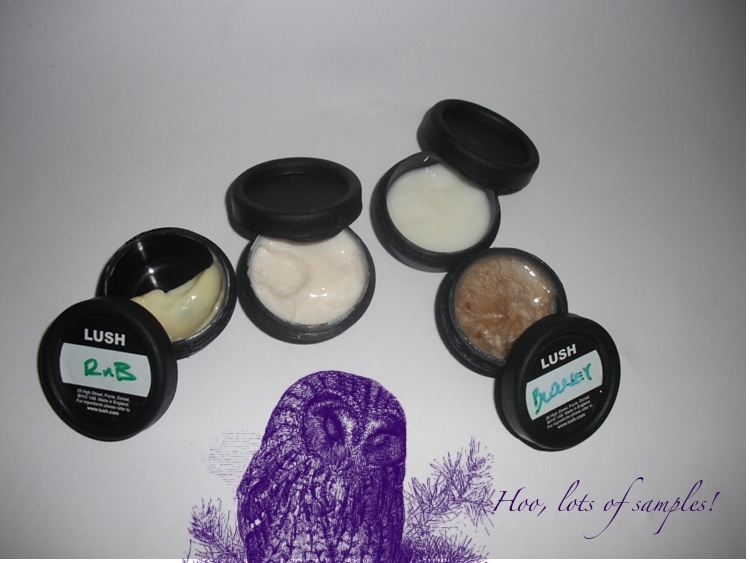 So, that’s my thoughts on my foray into Lush hair care – have you got any Lush holy grail hair products?